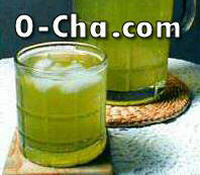 I ranked O-Cha.com's Uji Green tea as one of the best green teas I had the pleasure to taste in 2005. It's a designation that was well-deserved. Read my review of it here. O-Cha.com's Matcha-iri, which also comes in tea bag form, is another truly topnotch Japanese green tea. I'll defer to the manufacturer's description, rather than devise one of my own - "a concentrated sencha grown in Shizuoka Prefecture. A combination of loose leaf green tea and powdered sencha (not tea dust)...This is a strong green tea, and is especially recommended for iced tea, or for use with a larger sushi teacup. For iced tea, we recommend one teabag per liter/quart." What this description doesn't really tell you is that this is a very fresh, very green-tasting tea. O-Cha.com claims to take packaging and freshness very seriously and it shows. Because the Matcha-iri tea bags are so strong I generally steeped them in a large glass and threw out the first cup. The second cup was always quite excellent and the large bags are generally good for several more brewings, depending on your preference. O-Cha.com's $14.95 price for 20 tea bags may seem a bit steep at first, but keep in mind that these are large tea bags, good for making more tea than a standard bag. Most important of all is the quality of the tea, which is right up there at the top of the heap.